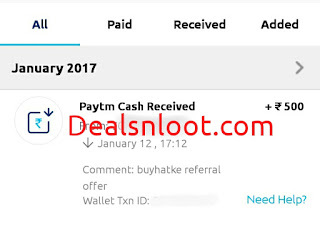 Hello Dealsnloot Readers,Buyhatke is Running amazing Refer & Earn Paytm Cash loot to get free Rs. 500 on Per Refer. No any app install to get this trick offer. Before this buyhatke Refer & Earn loot we was avail the shopping offer by Buyhatke app. For completing this offer you just spent only 1 minute to get your link. You also track your clicks and referrals. So guys to loot this offer.f You Invite 25 Friends You will Get Rs.500 Paytm Cash . Grab This offer as soon as possible. NEW UPDATE - OFFER END NOW. Update :- Those who have completed 25 referrals by 12:00PM, January 13th 2017 only would receive ₹500. Post that it would be ₹300 for the same. So you still have few hours left to grab Rs.500 Paytm Cash. 2. Click on Allow when a popup appears. This will Subscribe you to Web Push Notifications. 3. Now It will ask you to Enter your Mobile number. 4. Just Enter your Mobile number and Verify it via OTP verification Method. 5. You are successfully Registered with Buyhatke and Now ready to refer friends and Earn free paytm cash. 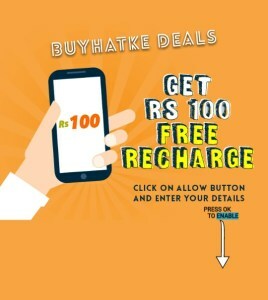 or Rs.100 Free Paytm Cash or Recharge when you refer 10 Friends. 1) Use link in Google Chrome browser only to subscribe & participate. 2) Minimum 10 friends required to subscribe via your link to get a recharge. 3) Maximum Rs 500 Paytm Cash or Free Recharge you can claim. After reaching 25 Referrals Just click on “Redeem Now” Button to redeem your earning or it will be automatically Redeemed. First of all , Note down your main account refer link. Clear data , Unsubscribe Notification Then Off Internet Connection For 5 Sec and restart chrome. Open link , Again allow and enter alternate number. Verify By otp , Now Shop anything. Repeat steps and Get unlimited up to Rs. 500. By this you can make own referrals and Loot it.